The New Forest is one of the relatively few places in Britain where great grey shrikes can consistently be seen. 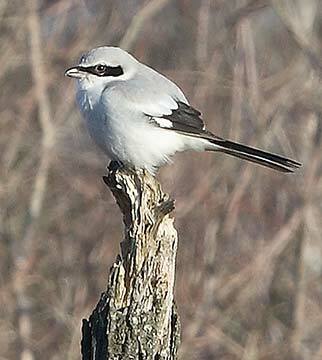 In fact, it could be said that the great grey shrike epitomises the New Forest heathlands in winter. Visitors from northern Europe, the first great grey shrikes usually arrive in October, whilst the last are recorded in late-March or early April. In all, half-a-dozen, or so, are often present annually, which is almost 10% of the British population. Distant views of a pale grey object are often the first hint of a great grey shrike’s presence, before the bird bounds away in often quite high-level flight. A little bigger than a starling, good views reveal a striking, boldly marked bird, a heathland sentinel at home wherever there are wide open spaces with scattered invading pine, gorse or other trees and bushes for use as perches. It’s not unusual, however, to see a great grey shrike atop a mature, woodland-edge beech or oak, or perched at the very top of a tall conifer. In fact, one such bird occasionally waits high in the trees at the Blackwater Arboretum, presumably anticipating the arrival of small birds at their winter roost site deep in the ornamental trees – they make a fine, late afternoon meal. Great grey shrike undersides are white, whilst the plumage above is primarily grey, splashed with black on wings and tail. A black stripe below the eye produces an inevitably fierce expression, whilst distinctively short, broad wings and fairly lengthy tail are particularly noticeable in flight. A cruel, subtly hooked bill provides a clue to diet, for great grey shrikes are predatory creatures that hunt from favoured perches, waiting, watching for signs of prey below. Small mammals such as mice and voles are taken with enthusiasm, and so are small birds, beetles and other large insects, invertebrates (including worms) and reptiles. The winter New Forest heaths, however, do not offer abundant foodstuffs: small mammals and large insects are not common; lizards and other reptiles for much of the time are deep in hibernation; whilst small birds occur only in modest numbers. Yet great grey shrikes survive, in part by hunting over relatively large areas, and also by storing food in times of relative plenty, ready for use in periods of famine, a habit that has given them the name ‘butcher bird’. Look out for great grey shrike larders - stores of food impaled on spikes of gorse, hawthorn or blackthorn. John Wise, in the early 1860s, noted dismissively: ‘A straggler is now and then killed by the New Forest keepers’, but made no other contribution to our knowledge of this enigmatic creature.